(Manzanita, Oregon) – Two unique events are coming up on the north Oregon coast in the latter half of February, with an especially energetic way to do shopping in Manzanita and a fascinating look at history in Seaside. Saturday, February 18 brings another “Cash Mob” to Manzanita: what organizers called a “fun day of patronizing your favorite Manzanita shops, restaurants, and lodging establishments with friends and family.” The north Oregon town sports a large array of deals at the stores, eateries and lodgings all over. First, everyone meets at the Manzanita Visitor Center at 11a.m., then the crowd is set loose. Hit the stores and hopefully spend a minimum of $25. Aside from exceptional sales, several shops will be offering special prize drawings. In turn, Manzanita business owners will show their deep appreciation. If you bring $50 in receipts back to the Manzanita Visitor Center by 4 p.m., you will be entered to win a prize. Among the winnings are: 5 class pass from Yoga Roots Studio, 5 hours of cleaning service from Sunset Vacation Rentals, a gift certificate from Sister's & Pete's Coffee & Treats, a welcome/membership package from Hoffman Center For The Arts, art prints from Amanita Gallery - and a few surprises. All receipts count: shopping, dining, and lodging receipts. 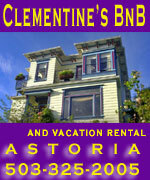 Staying at a Manzanita hotel or vacation rental that weekend? Show visitor center staff your receipt and get entered in prize drawing twice. The center is at the bottom of Laneda Ave, about a block from the beach. Call the Manzanita Visitors Center at (503) 812-5510 or email info@exploremanzanita.com for more information. Up the road a bit, at the north Oregon coast hotpost of Seaside, the next History & Hops free local history lecture focuses on early pioneer Calvin Tibbets. This happens at 6 p.m. on Thursday, February 23 at Seaside Brewing Co., located at 851 Broadway. Calvin Tibbets, an obscure stonemason, ventured to Oregon Country in 1832 with the goal of settling Oregon by Americans and making it part of the United States. The only Americans in Oregon before Tibbets had been explorers, fur trappers, scientists, and sailors. Tibbets’ perseverance set the stage for fellow Americans - first missionaries, then retiring mountain men, and finally wagon train pioneers - who eventually arrived in such great numbers that they overwhelmed all British claims to Oregon. Unfortunately, Tibbets died soon after achieving his goal, and all that he had done to achieve it faded into the shadows of Oregon history. Oregon author Jerry Sutherland will focus on the Wahoni Milling Company, a grist mill located where Seaside now meets Gearhart which was created in 1845 by Tibbets and his neighbors Elbridge Trask, Tom Owens, William Perry, and Edward Williams. Sutherland will invite questions and attempt to bring history forward by placing historical landmarks on today’s landscape. Sutherland spent two years scouring archives and visiting Calvin Tibbets’ haunts across Oregon, expanding on material collected by his father, Art Sutherland. History & Hops is a series of local history discussions hosted by the Seaside Museum on the last Thursday of each month at Seaside Brewing Co.